Everything in theology depends on knowing who Jesus Christ is, on what it means that he is confessed as Lord and savior, according to theologian and spiritual renewal specialist Andrew Purves. 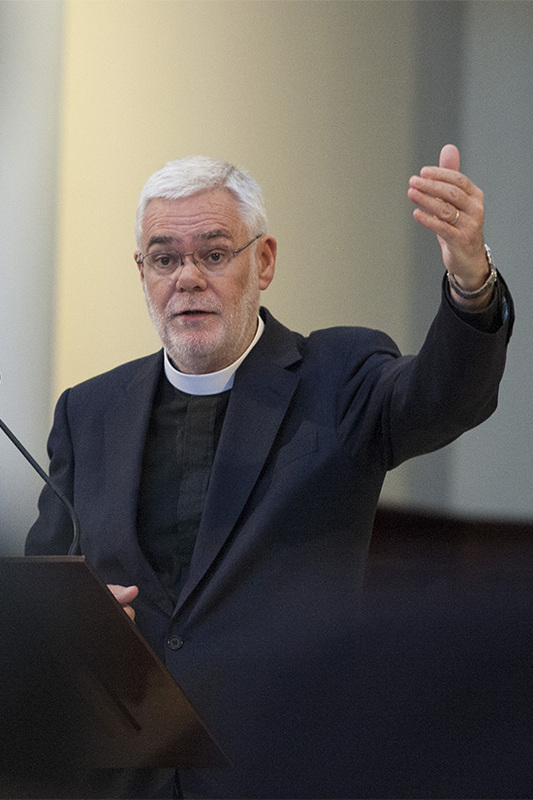 Speaking at the annual William E. Conger, Jr. Lectures on Biblical Preaching sponsored by Samford University's Beeson Divinity School in Hodges Chapel, Purves addressed the overall theme of "Christ in Ministry." He will also speak at the annual Ray Frank Robbins Lecture sponsored by the Samford department of religion in Reid Chapel Thursday, March 6, at 10 a.m. In a lecture titled "Who is the Incarnate Savior of the World," Purves suggested that if Christians go astray at the beginning by asking the wrong question, "we will never grasp the radical heart and significance of the gospel. Christianity's central doctrine--Jesus is Lord!--is given as the answer to the question: Who is the incarnate savior of the world?" Setting out the priority of the "who?" question, he said, places one on the trajectory of thought that characterized the ecumenical theology of the church. He referenced German theologian Dietrich Bonhoeffer as opening a remarkably insightful way into the cores of methodological issues dealt with in Christology. The Enlightenment philosophers do not set the boundaries for Christian reflection on the identity of Jesus Christ, according to Bonhoeffer. "They do not allocate for us which parts of our thinking are allowable or not," he wrote. The only real question which now remains, Bonhoeffer suggested, is: "Who are you? Speak for yourself!" For Bonhoeffer, the answer to the "Who?" question means that it is not we who have dealt with Jesus, but Jesus who has dealt with us, Purves noted. In asking "Who is the incarnate savior of the world," Purves suggests that we are really affirming what we already know. He referenced Thomas Torrance who wrote: "In scientific theology we begin with actual knowledge of God, and seek to test and clarify this knowledge by inquiring carefully into the relations between our knowing God and God Himself in His being and nature." Incarnation is central to Christian faith, Purves maintained. "The Church and Christian faith stand or fall on the reality and truth of the incarnation. It is the event in which faith associates the eternal God with a contingent fact of history, and attributes a saving significance to it," he said. "We cannot state the Christian thought of God except as we include Christ in our statement. He is an integral constituent of what, for us, God means." `Purves concluded his first lecture with the suggestion that the mystery of the final judgment is not for us to unravel but there is no doubt: "There is no other name under heaven by which we may be saved (Acts 4:12),for Jesus Christ, son of Mary, is the incarnate savior of the world." Purves, professor of historical theology at Pittsburgh Theological Seminary , is a native of Edinburgh, Scotland and came to the United States in 1978 to be minister of a Presbyterian church before joining the seminary. An author of several books, Purves holds the bachelor, masters and PhD degrees. The Conger Lectures are made possible through the generosity of the late Colonel Willam E.. Conger, Jr., who served many years as a personal advisor to Ralph Waldo Beeson, the founding benefactors of Beeson Divinity School.